As a native Alaskan, and part-time world traveler, I have had the opportunity to spend an excessive amount of time in a tent, contemplating philosophy, pop culture, and bad weather. 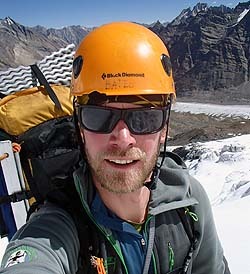 I’ve worked as a professional guide since 2004, and consider myself both an avid skier and altitude mountaineer. My vocation and passion have taken me extensively throughout Alaska, the Nepal Himalaya, and Northern India. With numerous ascents on Denali, Island Peak, and remote high altitude peaks, I like to think I have the drive and the skill sets to provide guests a remarkable and rewarding experience. As of 2014, I’ve been on six Denali expeditions, four of which were with Mountain Trip.